For other places with the same name, see Amsterdam (disambiguation). Amsterdam is a huge city with several district articles that contain information about specific sights, restaurants, and accommodation. Amsterdam is the Netherlands' capital and financial, cultural and creative center with more than 850,000 inhabitants. Amsterdam is known for the canals that criss-cross the city, its impressive architecture and more than 1,500 bridges. The city has a heritage dating back to the Dutch Golden Age in the 17th century as well as a diverse art scene and a bustling nightlife. The medieval center is the most visited area of Amsterdam and is home to tourist hotspots like Dam Square and the Red Light District. The area is filled with narrow streets, shops, tourists and coffeeshops. It also contains other interesting areas like the bookstores near Spui and the cafes of Nieuwmarkt. A UNESCO World Heritage Site, the Canal District was dug in the 17th century to attract wealthy home owners. And is still a posh neighborhood and home to the Dutch cultural elite. The Leidseplein and Rembrandtplein are the city's prime nightlife spots. A traditionally working class area gone upmarket with plenty of art galleries, hip boutiques and happening restaurants. Also includes the shopping streets of Haarlemmerbuurt and the quiet islands of Westelijke Eilanden. One of Amsterdam's prime areas, a trip to the city is not complete without a visit to the Museum Quarter. Snooty Oud-Zuid and Apollobuurt are filled with upscale boutiques, cafes and brasseries. You can chill in the Vondelpark with a bottle of wine or go hunt for bargains at the Albert Cuyp Market in multicultural De Pijp. West is a vast inner city area built at the turn of the 19th and 20th centuries in the Amsterdam School architectural style. The Vondelbuurt has beautiful stately mansions, while the Westerpark is the city's largest park with clubs, bars and plenty of cultural venues. Kinkerbuurt is an up and coming neighborhood with the De Hallen food market and many good restaurants and independent shops. An area that is undergoing significant development with new cultural venues like the NDSM-werf and the EYE Film Institute. The area east of the motorway A10 is a protected rural landscape. It is best explored by bicycle. Oost is a large and diverse residential area. The Eastern Docklands and IJburg stand out as lively upper middle class neighborhoods known for their modern architecture. Include the parks of Oosterpark and Park Frankendael. Amsterdam is not the seat of the government, which is in The Hague. Partly because of this, the city has an informal atmosphere unlike other capital cities its size. In fact, Amsterdam has a history of non-conformism, tolerance and progressivism. Attractions include the Rijksmuseum, Van Gogh Museum, Anne Frank House, Magere Brug, Albert Cuyp Market and the Vondelpark. The expansion of Amsterdam outside the ring motorway and the expansion of activity outside the city center is redefining what locals consider the 'central area' of Amsterdam. Zuid, especially with the construction of the Noord/Zuidlijn and the Zuidas, is becoming more and more important in the daily lives of the locals. Its significance for tourists has increased by the now completed reconstruction work on the Museumplein and the adjoining museums. 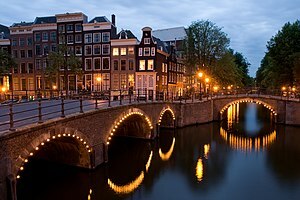 Amsterdam was first referred to as Aemstelledamme ("dam on the Amstel") in 1204, and known as Aemsterdam by 1327. It was first part of Utrecht, and around 1300 Gwijde van Henegouwen, bishop of Utrecht, gave Amsterdam city rights. After his death, the city was inherited by Count William III and became a part of Holland. Two fires swept the city in 1421 and 1452, and few wooden buildings from this period remain. A notable exception is the Houten Huis (Wooden House) at the Begijnhof. In 1558, the Dutch started to revolt against the Spanish as the local nobility demanded more political power and religious freedom. Amsterdam supported the Spanish, but as it became more and more isolated and trade suffered accordingly, it switched sides in 1578. A relative freedom of religion emerged in the newly established Dutch Republic, and many migrants sought refuge in Amsterdam, including Jews from the Iberian Peninsula, merchants from Antwerp and Huguenots (French Protestants). Catholicism could not be practiced openly. The Dutch Republic was not a unitary state, but a confederation in which the independent provinces and the larger cities were politically autonomous. There was a strong animosity between the Orange faction with its power base in The Hague and the republican faction with Amsterdam as its most outspoken representative, up to the point that the city was beleaguered by the army. The Orange faction supported the idea of hereditary political leadership vested in the princes of Orange as Stadtholders, while the republican faction supported civic independence. This long-standing culture of republicanism and non-conformism against the political elites in The Hague exists to this day. While The Hague had functioned as de facto capital of the Republic, Amsterdam (together with Brussels) became the new capital of the Kingdom. The appointment of Amsterdam as the new capital was a conciliatory gesture of the Orange faction towards the city and a recognition of the strong civic and republican basis of the new Kingdom. The Hague remained the seat of government and the political center of the country. When Belgium seceded in 1830, Amsterdam became the sole capital and got the rights to trade with the country's overseas possessions. The North Sea Canal and Noordhollandsch Kanaal connected Amsterdam's harbor directly with the Rhine and the North Sea. The Industrial Revolution arrived around 1860, which led to strong economic growth, but also to overpopulation as the city could not cope with the sudden demographic surge. The Jordaan was a notorious working class slum in this period, and neighborhoods like De Pijp were built to provide housing as cheaply and quickly as possible for the lower middle class. Social issues that arose in this period made Amsterdam the center of social democracy in the country. In World War II, German troops occupied the city and more than 100,000 Jews were deported to death camps, most famously Anne Frank. The diamond trade, before the war one of Amsterdam's top industries, almost completely disappeared as these businesses were mostly in the hands of Jews. The cultural revolution of the 1960s and 1970s changed Amsterdam radically. Soft drugs were tolerated, squatting became commonplace and riots with the police occurred on a daily basis. The coronation of Queen Beatrix in 1980 turned violent as protesters demanded a stop to the housing demolition that took place for the construction of Amsterdam's first metro line. In subsequent decades, Amsterdam has lost some of its revolutionary appeal, becoming a center for wealthy yuppies. Once poor districts like the Jordaan became upper class districts, and poorer inhabitants moved out of the center to the outer boroughs and other cities. The city's once progressive ideals have faded as squatting is cracked down on, coffeeshops are increasingly closed and prostitution is outlawed outside of the Red Light District. However, it is still a progressive and tolerant city by international standards. Its culture of republicanism and non-conformism are going through tough times as well, but the ubiquitous "Republic of Amsterdam" street signs show that it remains a defining characteristic of the city. Amsterdam is a large city and a major tourist destination, so you can visit it all year round. However, in winter the days are short (8 hours daylight around Christmas), and the weather may be too cold to walk around the city comfortably, let alone cycle. January and February are the coldest months, with lows around 0°C (32°F) and highs around 5°C (41°F). July and August are the warmest months, with an average temperature of 22°C (72°F) at daytime. Neither summer nor winter constantly have the mentioned values. In summer, heat waves (3 days above 30°C/86°F) are common, as is a temperature of 18°C (64°F) with rainfall. Snow does occur a few times each winter, but it's often light and rarely stays on the ground more than a couple of days. Always be prepared for rain. On average it's raining one in every two days, but it might as well be raining the full week of your trip. Gray clouds cover Amsterdam most of the time in winter and it rains a lot, but in spring and summer the sun shines six to eight hours a day on average. King's Day (Koningsdag) is always celebrated on 27 April, unless this date occurs on a Sunday (then it's celebrated the Saturday before). The weather on King's Day is usually quite good with temperatures hovering around 17°C (63°F). If it's raining, there will be considerably fewer people on the streets. 52.30814.7641691 Amsterdam Airport Schiphol (AMS IATA) (15 km (9.3 mi) southwest of the city.). This airport is among the five busiest in Europe for passenger traffic, serving over 63 million passengers in 2016. KLM is the largest carrier operating at Schiphol and offers flights to many major cities around the world. British Airways offers 15 flights per day to 3 London Airports; Heathrow, Gatwick and London City. Transavia, Vueling, TUIfly, Easyjet, and other low-cost carriers serve Schiphol, offering service to many cities in Europe. From Eindhoven Airport (EIN IATA), take a local bus (Hermes bus 401, duration about 25 minutes, frequency about four times per hour, €3.20 on board or €1.71 using an OV-chipkaart) to Eindhoven train station. From there take a train to Amsterdam Centraal (duration 1hr 20min, frequency four times per hour, single €17.20). Alternatively, take the express bus from the airport to Amsterdam Centraal, which takes 2 hours and 15 minutes. This bus only leaves 3 to 4 times per day; see their website for the schedule. The ticket price is €25.50 for a single ticket and €42.50 for a return. From Rotterdam The Hague Airport (RTM IATA), take a city bus (RET airport shuttle bus 33, duration 25–30 minutes, frequency every 10–20 minutes, €2.50 on board or €1.39 using the OV-chipkaart) to Rotterdam Centraal train station. From there, take a train to Amsterdam Centraal (duration about an hour, frequency every 10–20 minutes, single €13.40). Most trains arrive and depart from 52.3788894.9005562 Amsterdam Centraal. This architecturally stunning station was built in 1889 on an artificial island between the medieval center and the IJ waterfront. Other important train stations in Amsterdam are Amstel, Bijlmer-ArenA, Sloterdijk and Zuid. All international trains run directly to Amsterdam Centraal. The Intercity Brussels runs up to 16 times a day from Brussels (3 hr 18 min) and Antwerp (2 hr 23 min) at lower speeds than the Thalys. Usually cheaper than Thalys and a good alternative for budget travelers coming from Belgium. ICE International connects Amsterdam up to seven times each day with Düsseldorf (2 hr 6 min), Cologne (2 hr 20 min), and Frankfurt (3 hr 46 min). One ICE-train runs from Basel (6 hr 43 min). There is a BordBistro coach available on each ICE train. Tickets are also available through Deutsche Bahn (DB). Eurostar runs a twice-daily (morning and evening) high speed service from London St Pancras International to Amsterdam Centraal. The journey is approximately 3 hr 41 min, and prices start at £35 one way. Due to the UK not being a member of the Schengen Agreement, the return journey has to be made with a Thalys train from Rotterdam to Brussels Zuid/Midi. Here, you pass through UK border controls before catching a Eurostar back to London. The entire return journey takes 4 hr 45 min. Passengers who originate from Brussels can also book Eurostar journeys to Amsterdam. Tickets are sold on the Eurostar website. Thalys is a high-speed train that connects Amsterdam with Paris Gare du Nord (3 hr 19 min), Brussels Zuid/Midi (1 hr 54 min), and Antwerp Centraal (1 hr 12 min). Thalys trains run up to ten times a day. The cheapest tickets are sold early, so book in advance if possible. There is a bar coach available; if you're traveling in first class, a snack and drinks are included in the price. Flixbus. German low-cost bus company offering connections to many German cities such as Berlin, Cologne and Munich. Also offering domestic service within the Netherlands. Departing from Sloterdijk station. Reachable by Bus 22, trains and metro line 50. Other ferry services dock at Rotterdam Europoort (ferry from Hull) and Hook of Holland (ferry from Harwich). These are about 100 km away from Amsterdam. Hook of Holland has a train station but, as of early 2018, service is not running. Take a bus from the ferry terminal direct to Schiedam Centrum or local to Rotterdam Centraal and from there transfer onto a train to Amsterdam. As in the rest of the country, OV-chipkaart provides the only way of payment of transportation fees in the city. The former strippenkaart system ceased in 2010. To travel with OV-chipkaart, one has to check in at the start of the journey and check out at the end by holding the card in front of the card reader. Anonymous and disposable OV-chipkaarts can be obtained from GVB vending machines in all metro stations, from the desks at some larger stations (including Amsterdam Centraal) and some shops. Additionally 1-hour disposable cards can be bought on a tram or a bus but only PIN (debit and credit) cards are accepted to purchase them on board. After purchasing disposable cards from the driver or conductor, you must check in and check out with that card. For those who stay in Amsterdam longer, one of the day or multiple day passes could be a useful option. You can get them for 24 hours up to 168 hours. This allows the holder to travel on an unlimited number of journeys on the tram, metro and (night)bus throughout the validity period of the pass. Travel passes can be loaded on the anonymous cards but existing credit on such cards cannot be applied towards the purchase of a pass. 'NB: these sort of passes are not valid on buses operated by Connexxion and Arriva. These passes can be purchased at tourist offices (at Schiphol Airport and just outside Amsterdam Centraal), AKO bookstores, many hotels and GVB ticket offices. Additionally, a one day pass can be purchased from the conductor on a tram (but not on a bus). I amsterdam City Card is a good option that combines museum entries. There are five metro lines in Amsterdam, including a short underground section in the city center, that serves the suburbs. It takes 15–20 minutes from Centraal Station to Zuid or Bijlmer-ArenA in Zuidoost. The 5th metro line, the Noord/Zuidlijn (North/South line), finally opened on July 21, 2018. It's an underground metro line that connects the north of Amsterdam directly with the south of the city through the city center, hence the name. This major project started in 2003 and has proved somewhat of a disaster for the local government with large budget overruns and delays. Building in the wet soil of Amsterdam is difficult and some buildings along the line have sustained damage due to subsidence. Most trams these days have conductors, near the rear of the tram. Board by the driver or the conductor. If you have questions, the conductor will be sure to respond to your query. You can buy 1-hour, 24-hour, and 48-hour tickets from the conductors. A good map for cycling (routes, repairs, rentals and also public transport) is Amsterdam op de fiets (a Cito-plan). Bicycles can be taken for free on all ferries across the IJ, on all metros, and on some carriages of tram 26 with a bike supplement fee on the OV-chipkaart (€6.20 in 2018, not allowed in rush hours). Use the special bike racks, locations indicated by a bicycle sign on the outside of the carriage. Make sure to get a good lock (or two), and to use it. Amsterdam has one of the highest bicycle theft rates in the world. If you are buying a bike, prices that seem too good to be true are stolen bikes. Any bike offered for sale to passers-by, on the street, is certainly stolen. There's an old Amsterdam joke: when calling out to a large group of cyclists passing by "Hey, that's my bike!" about five people will jump off "their" bikes and start running. Taxis in Amsterdam are plentiful but expensive. Hailing taxis on the street is generally not to be recommended unless you are going to a well-known destination (e.g. Centraal Station or Schiphol). The liberalization of the taxi market in Amsterdam led to an influx of taxi drivers who have little or no clue of where they are going and who drive erratically and dangerously (e.g., driving on bicycle lanes instead of the main road or ignoring red lights). Tourists are advised to stick to public transport if at all possible. Get into a taxi only if you know the route yourself and are able to give directions to the taxi driver and if you know roughly how much the journey ought to cost so you don't get cheated. Cars are anything but miserable torture only outside the historic center; within the historic center, public transport is by far your best bet. In Amsterdam, a car is generally a liability and not an asset, as traffic is dense and parking spaces are quite expensive and very hard to find. Use a car only if you are going to an obscure location many kilometers out that is not served by public transport, or during the less busy times of the day or week, you may want to park near the Centraal Station and take the tram or walk. Driving here is a pain: many of the streets are narrow, the traffic (and parking) signs are baroque and obscure, and cyclists and pedestrians may get in your way. Plus, petrol is about €1.54 to €1.7 per liter. Popular car rental chains operate in a smaller capacity in Amsterdam, including Avis and Budget. Car 2 Go has all-electric smart cars available within and around the city. The Jordaan was built around 1650 along with the Canal District, but not for the wealthy merchants. For a long time it was considered a typical working-class area, and included some notorious slums. The name probably derives from the nickname 'Jordan' for the Prinsengracht. Apart from a few wider canals, the streets are narrow, in an incomplete grid pattern (as the grid followed the lines of the former polders located here in medieval times). This district is the best example of "gentrification" in the Netherlands, becoming a hip boutique district. There are several large warehouses for more specific uses. The biggest is the Admiralty Arsenal (1656-1657), now Het Scheepvaartmuseum at Kattenburgerplein. Others include the former turf warehouses (1550) along the Nes, now the municipal pawn office; a similar warehouse at Waterlooplein 69-75 (Arsenaal, 1610), now an architectural academy, and the warehouse of the West India Company (1642) at the corner of Prins Hendrikkade and 's-Gravenhekje. The city office for architectural heritage  has an excellent online introduction to the architectural history and the types of historical buildings available. The website includes a cycle route along important examples. Windmills were not built in urban areas, since the buildings obstructed the wind. The windmills in Amsterdam were all originally outside its city walls. There are a total of eight windmills in the city, most of them in West. However, the best one to visit is De Gooyer, which is not far from the city center, and is being used as a brewery. The only windmill fully open to the public is the Molen van Sloten in Sloten, a former village now part of West. Amsterdam has an amazing collection of museums. The most popular ones can get very crowded in the summer peak season, so it's worth exploring advance tickets or getting there off-peak (e.g. very early in the morning). Avoid the museums in the Binnenstad as these are mostly tourist traps. The quality museums can be found in Zuid, the Canal District and Plantage. The museums in Zuid are located at the Museumplein, a square surrounded by quality museums. The country's national museum is the Rijksmuseum, a must-visit with a large collection of paintings from the Dutch Golden Age. Some artists that can't be overlooked are Rembrandt, Johannes Vermeer, Frans Hals and Jan Steen. The most widely regarded paintings are Rembrandt's Night Watch and Vermeer's Milkmaid. The museum also boasts a substantial collection of Asian art. Reopened after a reconstruction of about ten years, its renewed set-up is absolutely worthwhile, leading the visitor through the ages from the late Middle Ages to the early 20th century. Even someone with little knowledge of art must have heard about Vincent van Gogh, the Dutch Post-Impressionist painter whose work had a far-reaching influence on 20th century art for its vivid colors and emotional impact. The Van Gogh Museum has the largest collection of Van Gogh's paintings and drawings in the world. The Stedelijk Museum is all about modern art, contemporary art and design. A newer addition to Amsterdam's already stellar set of art museums is the Hermitage in Plantage, the largest satellite branch of the famous museum from Saint Petersburg, Russia. The Museumkaart costs €59.90 (or €32.45 for those under 18 years old). It covers the cost of admission to over 400 museums across the Netherlands and you can buy it at most major museums. It is valid for an entire year, and you will need to write your name, birthday, and gender on it. If you are going to the Rijksmuseum and Van Gogh Museum, those are €15 each, so this card can quickly pay for itself. The tickets to the major museums, including the audio guide, can be bought early from the tourist information desk at no extra cost. Alternatively, for short stays, you can consider buying the I amsterdam City Card, starting at €42 per day, which includes "free" access to Amsterdam museums, public transport and discount on many tourist attractions. Since the Middle Ages and throughout the 17th century, the Netherlands was a country with a relatively high degree of freedom and tolerance towards other religions and cultures, especially compared to other countries in Europe, with the major exception being the persecution of Catholics after winning the war with Spain and during and after the Eighty Years' War. Between 1590 and 1800, the estimated foreign-born population was never less than 5 percent, many of them settling in Amsterdam. This led to a large migration of Jews, Huguenots (French Protestants), Flemings, Poles and other people to the city. Jews in particular had a large presence in Amsterdam, notably in the Jodenbuurt, though this quarter has changed significantly after World War II. The most prominent synagogue is The Esnoga (or The Portuguese Synagogue), built in 1675 in an austere Classicist style. The late-medieval city also had smaller chapels such as the Sint Olofskapel (circa 1440) on Zeedijk, and convent chapels such as the Agnietenkapel on the Oudezijds Voorburgwal 231 (originally 1470), now the University of Amsterdam museum. Later churches included the Oosterkerk (1669) in the eastern islands, and the heavily restored Lutheran Church on the Singel (1671), now used by a hotel as a conference center. Catholic churches were long forbidden, and built again only in the 19th-century. The most prominent is the Neo-Baroque Church of St. Nicholas (1887) opposite Centraal Station. Also, investigate some of the "hidden churches" found in Amsterdam, mainly Catholic churches that remained in activity following the Reformation. A prominent hidden church is Ons' Lieve Heer op Solder. Well worth the visit. Two hidden churches still in use are the Begijnhofchapel near the Spui, and the Papegaaikerk in the Kalverstraat (both Catholic). The locals spend their summer days in Amsterdam uncorking bottles of red wine in the Vondelpark—and so should you. Every district in Amsterdam has at least one park, but the Vondelpark stands out for its size and convivial atmosphere. The neighborhood best known for its trees and gardens is the Plantage. Besides leafy boulevards and grand mansions it also features the botanical gardens of the Hortus Botanicus and has Artis Zoo for the kids. Amsterdam also has so-called city beaches. Yes, it's now possible to lay in the sand far from any natural coastline! Amsterdam has three of these beaches, which are located in West, Oost and Zuid. The one in Oost, Blijburg, is the best of these, and you get the fine architecture and atmosphere of the IJburg neighborhood included for free. Sport: watch football ie soccer at AFC Ajax. They play in (and often win) the Eredivisie, the top tier of Dutch football. Their home ground is Johan Cruijff ArenA (capacity 54,000) 5 km south of the centre, metro station Bijlmer ArenA. Their second-string team Jong Ajax (or "Ajax 2") plays in Eerste Divisie, the second tier: their ground "Sportpark De Toekomst" is near the ArenA. Amsterdam Boat Experience, Nieuwe Spiegelstraat 70-1 (Office), ☎ +31 20 771 59 30, e-mail: Info@amsterdamboatexperience.com. 09.00-22.00. (updated Oct 2017) Amsterdam Boat Experience was founded in 2015 and has been steadly expanding its fleet and now offers exclusive private charters while also operating a fixed route from the Anne Frank house. Tickets for the 1 hour cruise on the luxurious electric open boats with live narrating are €15,-. while you relax the hostess serves drinks on the boat. Adam's Boats. Rent a boat without the need for a licence. The Amstel river can be reached within 2 minutes from the hire place. Sail Amsterdam. Tall-ships from all over the world come to visit the Amsterdam harbor every five years, the next one is in 2020. Vrije Universiteit. Founded in 1880, the VU campus is located southwest of the city center, and approximately 20 minutes away by bicycle. It is the only Protestant general university in the Netherlands. Many people will find it difficult to get a suitable job if they do not speak Dutch. However, hostels and hotels in Amsterdam may need bar staff, night porters etc., who speak English and other languages. There are also specialist websites for English and non-Dutch speakers looking to work in Amsterdam and they are an often a good place to start: Jobs in Amsterdam , Blue Lynx, Undutchables, Unique, SAM Recruitment and Xpat Jobs are all useful resources. Immigration matters are dealt with by the immigration service IND. Registration is done by both police and municipalities. Immigration policy is restrictive and deliberately bureaucratic, this is especially true for non-EU citizens. European Union citizens do not require a work permit. Australians, New Zealanders and Canadians are afforded a one year working-holiday visa. In general the employer must apply for work permits. Immigration is easier for higher educated (Bachelor's or higher) earning a gross annual salary of over €45000 (over €33000 for those under 30). Interesting independent shops and boutiques are located in the side streets of the main canals (Prinsengracht, Keizersgracht, Herengracht) and especially in the Jordaan. The Haarlemmerstraat and Haarlemmerdijk are claimed as best shopping streets in the Netherlands. The area around Museumplein in Zuid has Amsterdam's upmarket shopping streets. The P.C. Hooftstraat and the Cornelis Schuytstraat have the finest designer shops in the city. You can find designer shoes, health and well-being specialists, massage parlors, fashion boutiques, designer interiors, designer florists and specialist shops. The partly gentrified neighborhood of De Pijp—around Ferdinand Bolstraat and Sarphatipark—is slowly becoming the 'second Jordaan'. In the areas surrounding the city center, the main shopping streets are the Kinkerstraat, Ferdinand Bolstraat, Van Woustraat, and the Javastraat. The most ethnically diverse shopping street in Amsterdam is the Javastraat. There are some toy stores and clothing shops for kids in the center, but most are in the shopping streets further out, because that's where families with children live. Particularly IJburg has a good set of shops for families. Surinamese food is widely available and worth a try. The highest concentration of Surinamese restaurants can be found in Zuid and Zuidoost, especially in the Albert Cuypstraat. Locals recommend the roti met bonen, moksi meti, petjil and bojo as dessert. Try the dawet as well; this typical drink is made from milk, coconut milk and rose sirup and has sago balls in it. Most kids like it. Dawet can also be found in many Indonesian restaurants. The Lange Leidsedwarsstraat (just off Leidseplein) has about five Italian restaurants that sell pasta or pizza for €5 among many tourist traps. Many restaurants of all kinds can be found in the Haarlemmerbuurt. Also worth trying is the Van Woustraat in De Pijp, or continue to the Rijnstraat in the Rivierenbuurt. Exquisite but expensive restaurants can be found in the Utrechtsestraat. While there are exceptions, in general avoid restaurants along Damrak and be cautious around Leidseplein—they are well known tourist traps. Amsterdam's famously wild nightlife caters to all tastes and budgets. The archetypical Amsterdam watering hole is the bruine café ("brown bar"), a neighborhood bar of sorts with gorgeous dark wood panelling—hence the name—and booths. Grand cafés are more grand and spacious, and also serve small food portions. These usually have at least one long table with newspapers and magazines. Lounge and designer bars pop-up across the city catering to the city's younger and more trend susceptible crowd. If you're a beer lover consider visiting a beer shop or tasting room in the Binnenstad or the brewery in Plantage. There are some excellent beers you can get from this part of the world such as wheat beer (witbeer). Many coffeeshops offer a 'smoking lounge' where soft drugs may be used. Despite the confusion on the subject, the country-wide smoking ban applies only to tobacco. However, since the Dutch commonly smoke tobacco mixed with their marijuana or hash, many coffeeshops, especially those unaccustomed to tourists, may require all smoking to be done in a separated smoking section or outdoors. Most central coffeeshops with large tourist clientèles will allow marijuana or hash smoking in their entire space, requiring you to smoke in the separated section only if your joint contains tobacco. Many coffeeshops also provide a non-tobacco herbal filler for those who find pure joints too strong. You may usually smoke joints containing this herbal filler anywhere within the coffeeshop although individual house rules may vary. If in doubt, always ask the staff. Amsterdam has over 400 registered hotels of varying standards from budget facilities to some of the most expensive hotels in Europe. Advance booking is recommended, especially for weekends and holidays. Don't expect you'll find an affordable bed once you're here. Most hotels and hostels can be found in the Binnenstad, notably south of Centraal Station, and in Zuid around the Museum Quarter. Charming boutique accommodation can be found in the wealthy residential Canal District, home to the rich and famous and its squares are the prime nightlife spots of the city. The Jordaan is another area for hip boutique accommodations, slightly upmarket, but still for mid-range prices. Some cheaper hostels can also be found in the Red Light District. Do not expect a wide number of services from cheaper end hostels and hotels. Most of these do not have elevators and have the usual steep staircases; if you suffer from vertigo, do get an assurance that you will be getting a first or second floor room or book a hotel that has an elevator. Be cautious in the Red Light District. All kinds of people walk around there during the day, including families with children, but the area does attract seedier visitors and vagrants after sunset. As a tourist hotspot the area attracts a lot of pickpockets. Do not take photographs of the prostitutes, you will be yelled at or worse. Groups of women visiting the Red Light District at night might feel harassed in the aggressive environment, though this is said to be the safest area because of the police presence. Keep to main streets and groups. Although not really dangerous, women might want to avoid the narrow lane north of the Oude Kerk after dark as the atmosphere can be quite intimidating. The outer boroughs have profound differences in safety levels. Nieuw-West and Zuidoost still have a bruised image regarding violence and harassment. Urban renewal projects have improved conditions, but you should still be aware of the situation. 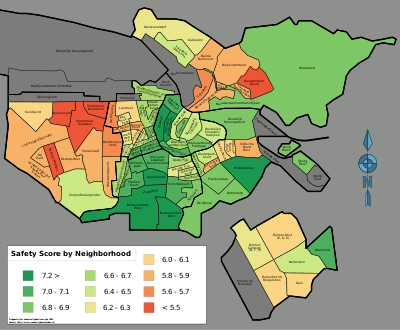 Noord also has some rougher neighborhoods, but the rural parts are safe. Oost is largely safe, but there are some neighborhoods east of Oosterpark where some travelers might not feel comfortable. Zuid is perfectly safe, even at night. The usage of magic mushrooms has been forbidden since December 2008. So-called smartshops do not sell any illegal products, but a range of dietary supplements, including 'herbal ecstasy'—a legal attempt at an ecstasy pill alternative which is a complete waste of money with various more or less obscure psychedelic herbs and, despite the change in the law, one type of magic mushrooms. It is the latter which causes problems as people often underestimate their strength. Magic mushrooms have few physical risks attached to them, but can have a very strong short-acting psychological effect, which can either be great or very distressing, depending on your own mindset (e.g. if you are relaxed, have any serious worries, history of mental illness, etc.) and your surroundings (e.g. if you feel comfortable and safe in them). Pay phones are increasingly rare as most people have a mobile phone. That's why pay phones mostly cater to tourists and can be found around tourist areas. Centraal Station has pay phones in groups of six near the main entrance. If making local calls from a pay phone, you may need a phone card (€5 minimum) as many green KPN telephone booths do not accept coins. Phone cards can be bought at post offices and some delis, although the cards are increasingly hard to find. The KPN booths are being replaced by newer models that will accept coins again. Blue/orange Telfort booths accept both coins and cards. This does not mean that you can get away with anything in Amsterdam. In any case, public attitudes and official policy have hardened compared to some tourist perceptions. The number of coffeeshops has decreased significantly and new laws forbid the selling of dried hallucinogenic mushrooms. Window prostitution outside the Oudezijds Achterburgwal is slowly but surely being closed down by the local authorities. Even though Amsterdam is the capital of the Netherlands, embassies are located in The Hague, as the government is situated there. Amsterdam Spoke. An English magazine featuring Amsterdam's daily life, its ambiance and trends. Time Out Amsterdam. The monthly bible for what is going on in town. Can be purchased all over town. Uitkrant. A free monthly magazine, listing all concerts, classical, jazz, pop etc., exhibitions, museums and anything cultural to do in Amsterdam. It can be picked up at many spots in the city, e.g. at the Uitburo at the Leidseplein. Basiliek van de Heilige Nicolaas, Prins Hendrikkade 73 (tram or metro Centraal Station), ☎ +31 20 624-8749. Eucharist Su 10:30 (Dutch), 13:00 (Spanish), Low Mass M W Th Sa 12:30 (Dutch), Tu 12:30 (English), F 12:30 (Spanish). Begijnhofkapel, Begijnhof 29 (tram 1, 2 or 5 to Spui), ☎ +31 20 622-1918. Eucharist M-F 09:00 and 17:00, Sa 09:00, Su 10:00 (all Dutch) and 11:15 (French). Roman Catholic chapel at the Begijnhof, officially known as the HH. Johannes en Ursulakapel. De Krijtberg, Singel 448 (tram 1, 2 or 5 to Koningsplein), ☎ +31 20 623-1923. Eucharist M-Sa 12:30, 17:45, Su 12:30, 17:15 (all Dutch), High Mass Su 09:30, 11:00 (Latin). Officially St. Franciscus Xaveriuskerk. De Papegaai, Kalverstraat 58 (tram 1, 2 or 5 to Dam). Low Mass M-Sa 10:30 (Dutch), High Mass Su 10:30 (Latin), 12:15 (Latin). Officially the HH. Petrus en Pauluskerk. English Reformed Church (Engelse Hervormde Kerk), Begijnhof 48 (tram 1, 2 or 5 to Spui), ☎ +31 20 624-9665. Sunday worship at 10:30 (English). A Reformed Church led by a (Presbyterian) Church of Scotland minister. An English speaking congregation at the Begijnhof. The Lady of All Nations, Diepenbrockstraat 3 (near the RAI Convention Center), ☎ +31 20 662-0504. Holy Mass M W F Sa 12:15, Tu: 07:15, Th 18:30, Su 9:30, 11:15 (all Dutch). Mass times are subject to change. Call to be certain. Onze Lieve Vrouwekerk, Keizersgracht 220 (tram 6, 13, 14, 17 or bus 21, 170, 172 to Westermarkt), e-mail: info@olvkerk.nl. Holy Mass Sa 19:00 (Dutch), Su 11:15 (Dutch), 18:00 (English). Oud-Katholieke Kerk Amsterdam, Ruysdaelstraat 39 (tram 16 or 24 to Ruysdaelstraat), ☎ +31 20 662-8313. Eucharist Su 10:00 (Dutch). A Dutch denomination in communion with the Church of England (Anglican). Parish of the Blessed Trinity, Zaaiersweg 180 (tram 9 to Brinkstraat), ☎ +31 20 465-2711. Mass Su 10:30 and 12:00 (both English). Almost any place in the Netherlands can be reached within 3 hours of rail travel. To avoid a big list, day trips have been divided into those close to the city (about 30 minutes by public transport) and those further afield. This city travel guide to Amsterdam has guide status. It has a variety of good, quality information including hotels, restaurants, attractions and travel details. Please contribute and help us make it a star! This travel guide page was last edited at 23:55, on 6 April 2019 by Wikivoyage user ARR8. Based on work by Wikivoyage users Neils51, Saucy, Ikan Kekek, Ibaman, Gati123, Traveler100bot and CommonsDelinker, Wikivoyage anonymous users 75.172.189.173 and 84.241.206.69 and others.